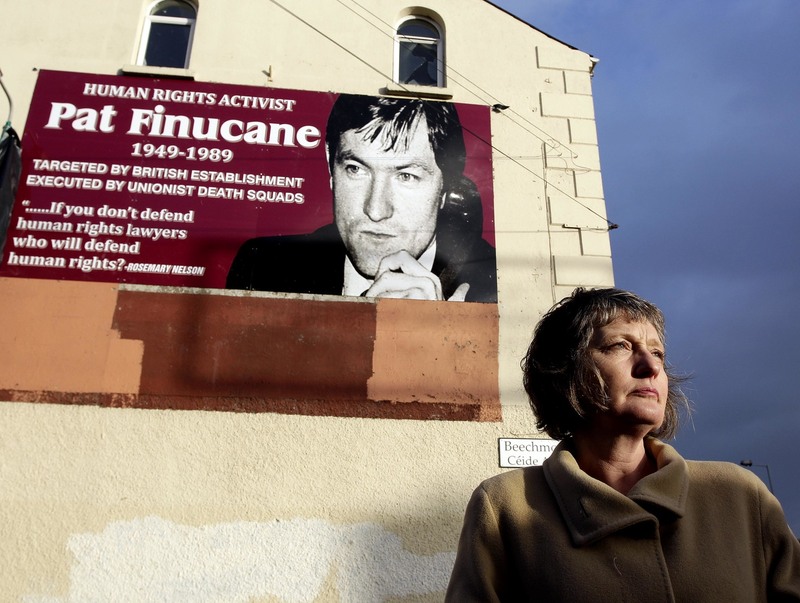 On October 2011 the family of Pat Finucane came face to face with British Prime Minister David Cameron in 10 Downing Street for what they thought would be the announcement of a public inquiry into the solicitor’s murder. Instead the family were informed that previous Prime Minister Tony Blair’s promise of a public inquiry had now been overruled and replaced with a review of existing evidence to be carried out in private by barrister Desmond De Silva QC. Quite why the British government would not allow a public inquiry remains unclear as Mr Cameron told Geraldine Finucane that he accepted there had been collusion in her husband’s murder. Veteran human rights campaigner Jane Winter, who was present at the meeting, says there was a moment which provided some insight into where the power within the British establishment may actually lie on this subject. Recalling the Prime Minister’s response, Ms Winter said: “Cameron went completely off script at that point and he said `look, the last administration couldn’t deliver an inquiry in your husband’s case [he was addressing himself to Geraldine Finucane] and neither can we. Ms Winter said that as the Prime Minister made the admission he raised a finger and made a circular motion in the air. 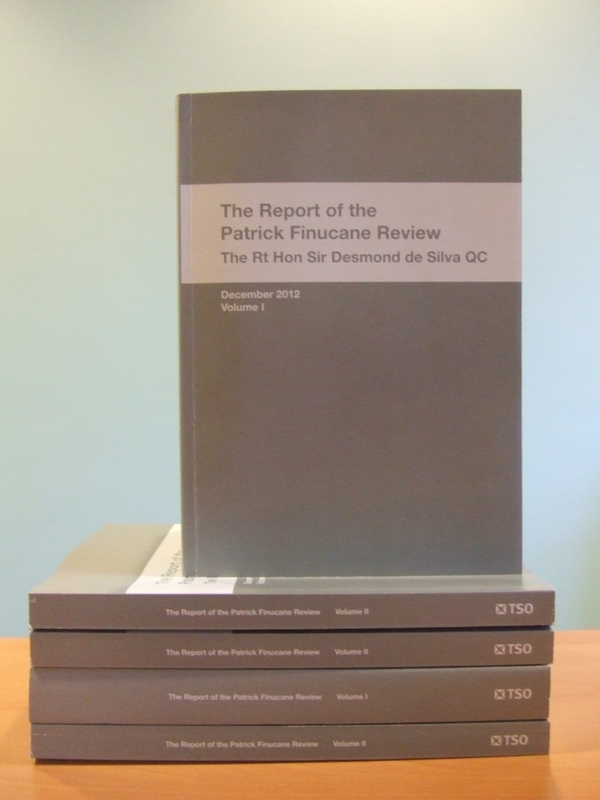 This morning the Finucane family is back in London – this time to hear the outcome of Mr De Silva’s review of the official government papers into the solicitor’s 1989 murder. It is a long way from the public inquiry which the family has been demanding for 23 years. The Finucanes question what, if anything has changed since Mr Cameron’s revelation that there were those in the British establishment who would never allow such an inquiry to take place. A major concern is that the Finucane’s legal team has had no opportunity to challenge the validity of evidence supplied by the RUC/PSNI, MI5 and British army – crucially as all three agencies are centrally implicated in the allegation of security force collusion in the murder. It is understood that Mr De Silva, who was formerly a member of a political think tank for Prime Minister Margaret Thatcher in the 1980s, will not make any recommendations in his 500 page report, which includes an additional 500 page annex. It is expected that the majority of the content of the De Silva report, due to be announced by Mr Cameron in the House of Commons today (Wednesday), has already been put in to the public domain by previous investigations into the solicitor’s murder. The identity of the killers is well known. It is also known that at least three security force agents (Brian Nelson, Billy Stobie and Ken Barrett) were centrally involved in the murder; and crucially that Nelson and Stobie had also warned their army and Special Branch handlers that Pat Finucane was going to be killed – yet no action was taken to prevent the attack. Geraldine Finucane says that her quest for a public inquiry is driven by a desire not to unmask those who fired the actual shots that killed her husband but instead to identify those in the British establishment who the family believe pulled the strings which led to the 39 year-old being shot 12 times in front of his wife and three children as they sat down to dinner on Sunday February 12, 1989. The family fear that, in the absence of an independent inquiry, the De Silva report will fail to identify the establishment figures suspected of ordering and then turning a blind eye to Pat Finucane’s murder. Over the last 20 years there has been a series of official inquiries into the murder, by Sir John Stevens and retired Canadian judge Peter Cory. However the activities of one agency – MI5 – has escaped any real scrunity. The activities of MI5 in Northern Ireland in the 1980s were overseen by a Director and Coordinator of Intelligence (DCI) stationed at Stormont. The MI5 chief had responsibility for policy, direction and coordination of intelligence work undertaken within Northern Ireland. He was in charge of MI5 agents who regularly liased with both FRU and Special Branch. Documents obtained by Judge Cory revealed that MI5 agents had warned on three separate occasions over a 10 year period that the UDA had plans to kill Pat Finucane. As early as August 1981 an MI5 agent had warned of a planned attack on the solicitor. The Security Service alerted the head of RUC Special Branch but minutes of the meeting indicate that, while the threat was thought to be both “very real and imminent”, it was decided that no action would be taken as to intervene would compromise the security of the agent. Special Branch decided not to inform Mr Finucane that his life was in danger. A similar threat went unheeded in 1985. In December 1988 MI5 was informed that the UDA planned to kill three solicitors; Pat Finucane, Oliver Kelly and PJ McGrory. Even after Mr Finucane’s murder weeks later no effort was made to warn the other two solicitors that their lives were in danger.